While the notion of using a personal cell phone at work was still a bit of a taboo just a few years ago, times have changed. The smartphone has vastly transformed the way we communicate - and the need to be connected, 24/7. But even with the broadening of cell phone carrier networks and the expansion of signal towers, many worksites and offices continue to suffer from poor cell phone signal reception. Increasingly, companies recognize that smartphones are more than just a vital lifeline to their employees’ families and friends. iPhones and other personal devices have also become a critical part of the way many businesses keep in touch, whether it be voice calls, text messages or the use of wireless data to provide real-time evaluations of the speed and effectiveness of the mobile apps and sites they offer customers. According to Demand and Opportunities for In-Building Wireless Solutions in the U.S., a July 2015 study sponsored by Ericsson and Fujitsu, three-quarters of American workers now have and use smartphones while in their offices – with half of those employees using their devices for work-related email and messaging. Unfortunately, many offices, factories and public buildings have pockets of no-signal zones because of construction materials, distance from towers or location above street level, even an employer-issued smartphone can be rendered virtually useless by poor reception. 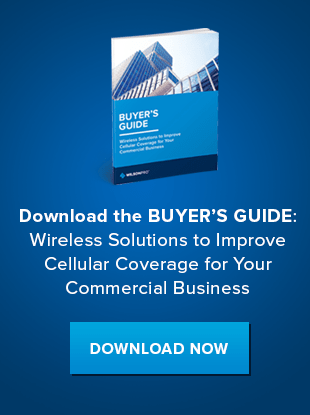 Businesses who recognize the ability to capitalize on the wireless connectivity experienced by their employees have begun to understand the advantages of providing a cell phone signal repeater in their workplace. By creating a virtual pipeline of enhanced cell phone signals – regardless of the carrier, and regardless of the location inside the office – employers can help boost productivity in a number of ways. There are few things quite as annoying as a clipped voice call, or a conversation that drops out mid-sentence, especially when both parties are in office settings, not driving over a mountain pass. The ability to guarantee clear, full-strength cellular voice calls is one sure-fire way to return to one of those comforts we remember from the days of land-line phones: real conversations, full of tone, color and life. That might seem like an overstatement, but consider all the conversational nuances we’ve lost – plus the added sense of urgency and brevity – that comes from the unpredictability of cell phone signals. Lock in a five-bar signal, even in the basement of your office, and the smartphone is transformed from a convenience to a real business tool. Cell phone carriers continue to boast about enhancements to the speed of their networks, but when the signals fade, so does the ability to download web pages, upload photos or transfer business PDFs. By providing a full-strength data signal – LTE or even faster emerging protocols for cellular data – employees are able to provide faster turnarounds for the job at hand. The ability to see web pages loading in real time, check on the speed of downloads for business-related apps or simply receive and comment on an important business document, all add up when measuring productivity. We’ve all experienced the phenomenon of the physical quest for the strongest cell phone signal in the office, and the empty desks that result as employees go on the search for that one spot where they’ll get full bars on their device. If workers are instead able to get more than adequate reception at any location in the building, their incentive to leave their desk to make or receive an important call is radically diminished, as is the likelihood that an important call will drop mid-sentence. Looking to keep your workers more focused on the task at hand? Providing something as simple as a cell phone signal repeater can do the trick. If you’d like to find out more WilsonPro’s productive solutions to enhance the cell phone signals at your worksite, visit our products page or download our case study.